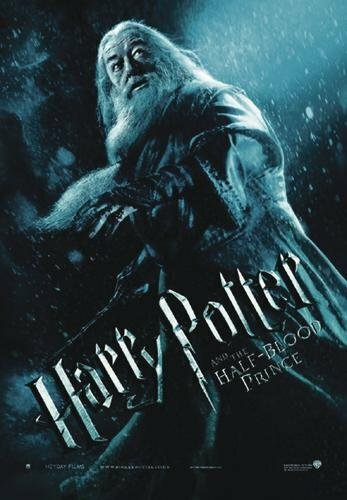 Are you looking for Harry Potter posters that not everybody has? Here my selection of the best, and least known!, ones. 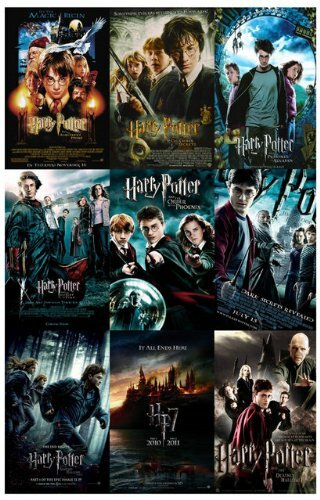 The one on the left is a true classic amongst the many Harry Potter movie posters. 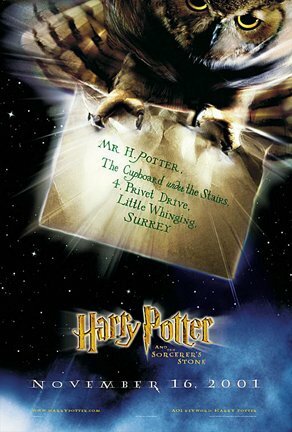 It shows the letter of acceptance the owls tried so desperately to deliver to Harry in the first film and book 'Harry Potter and The Philosopher's Stone'. And no, this owl is not Harry's Snowy Owl Hedwig, it is a great eagle owl that carries the famous letter addressed to 'Harry Potter, The Cupboard under the Stairs' in her or his claws. Bearing in mind that this poster is from 2001 it is, nearly, a collectors item. I love especially the dramatic composition and the star-filled sky in the background. 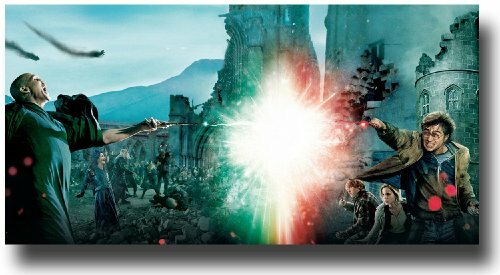 The poster above shows the last duel between Lord Voldemort and Harry Potter during the Battle of Hogwarts. What I like about this one, is the landscape format, which makes for a nice change from the 'normal movie posters' which are typically in portrait format. What I don't like so much are the big red sparks in the foreground, especially on Harry's side of the image. If you click the image, you can actually zoom in and out and see for yourself if you like this effect or not. With 11x17 in / 28x44cm this is a middle-sized poster that looks very nice when framed and hang on a wall with some space around it. It really does need a bit of space, if not your wall will easily look overcrowded. I put these two together as they, hm, belong together? 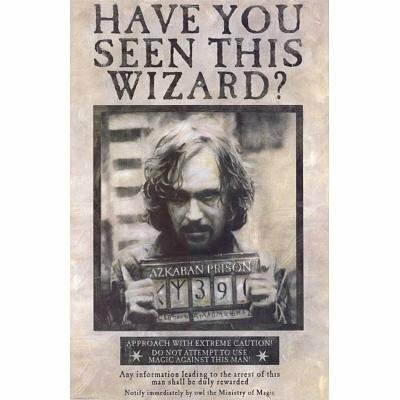 The first one shows Sirius Black on the 'Wanted!' 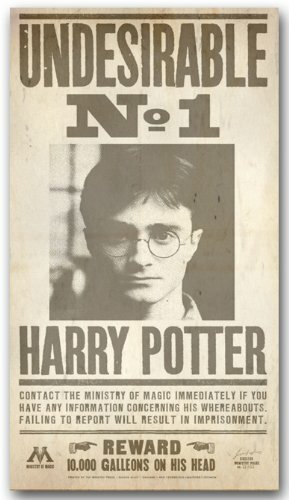 poster of the Ministry of Magic from the third book 'Harry Potter and The Prisoner of Azkaban' onwards. 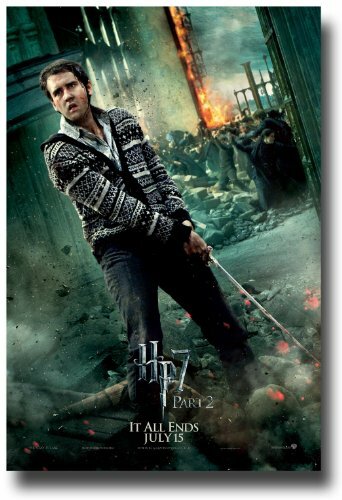 And the second shows Harry's from the last book and movie. I like how these two characters ended up in the same spot and are now connected by the same fate - or not? The main protagonists, or should I better say - antagonists?- of the series. I like how Snape is shown in the middle, as until the very last chapters of the last book his role and allegiance is still doubtful. 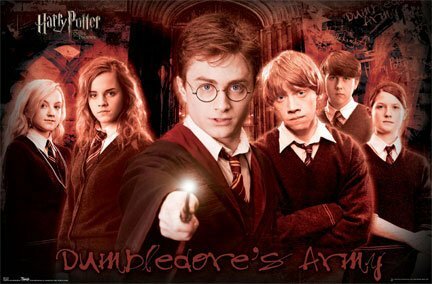 But I am wondering a bit why Harry is paired with Draco in the composition. For me, it would have made more sense if Draco and He-Who-Must-Not-Be-Named would have swopped places. But putting Bellatrix and Hermione in juxtaposition is really genius, as these two female characters couldn't be more different from each other. With 24x36in / 60x90cm this is a really decent sized poster that will look great on a door or wall. Special offer from the seller: Save 10% each qualifying items by the same seller by applying code ORNJ87Z6 at checkout (restrictions apply). If wall space is limited, this might be just the right poster! 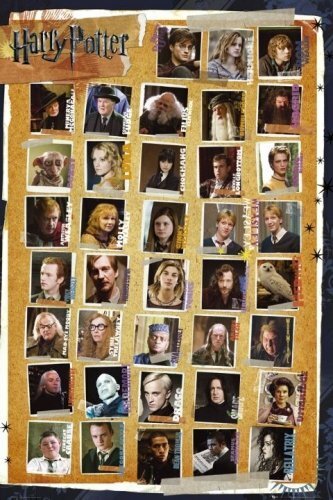 It shows all the main characters, and also some minor ones, that appeared in the movies. It resembles a bit of a pin board, or story board, in its layout and that is part of its charm for me. 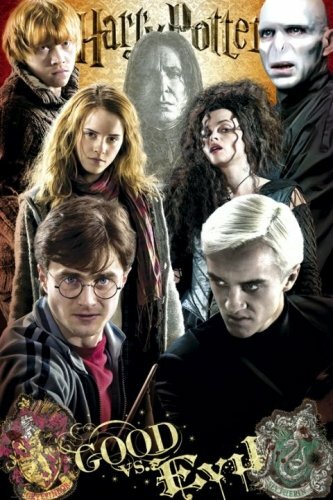 The only thing I don't like so much is that Snape is deep in the group of the evil ones. It would have been nice, if he had been given more of a borderline position. A really stunning poster based on the events in 'Harry Potter and The Order of The Phoenix' that shows the core members of Dumbledore's Army. I like especially that it is a horizontal format (24x36in / 60x90cm) which makes for a nice change in décor. And I also like that it shows two of my favorite characters, Luna and Neville, in a prominent position. With three female characters on it, this one would make a great addition to any female Harry Potter fan's room and the nice, reddish sepia tone will fit with a lot of interior designs and will also give the room more warmth than a classic, bluish poster. Perhaps my favorite character, after Ron, Hermione and Harry of course. The development Neville has undergone during the seven books of the series is simply astonishing. From a clumsy boy that was so prone to accidents that his own family doubted he would ever turn out to be a wizard to the hero of the Battle of Hogwarts that killed Nagini, Voldemort's snake and horcrux. 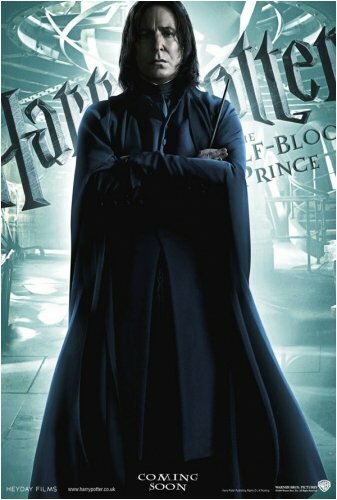 This poster shows him just as he achieved this, to make Tom Riddle mortal once again, by killing the last horcrux that tethered the Dark Lord to life. 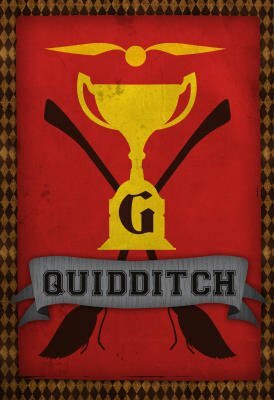 Little, nearly a squib, Neville that forever loses his toad Trevor has become in the end a hero worthy of Godric Gryffindor's own sword. And he used it well! Another solution for small rooms and limited spaces, this poster is a collage of the movie posters for all eight films, plus one. The only thing I would have wished regarding this one to be different, would have been the addition of a nice black grid to it, to separate the superb images even better. As it is, the poster seems to be a bit fidgety or choppy, but nevertheless I am sure it makes a great addition to the room of any fan as it summarizes the story nicely. And last, but certainly not least, here my personal favorite one. 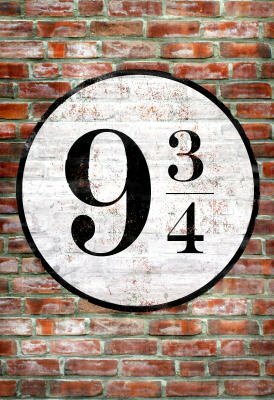 Which fan wouldn't dream of having Platform 9 3/4 in his or her own room, ready to be entered when it is time to travel to Hogwarts? 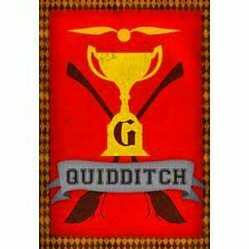 With this I leave you, I have an appointment with Madam Malkin in Diagon Alley - I need new robes! Go To the Hidden Platform! Always read the reviews first and then decide if you buy or not. To see other customer reviews, apart of mine, just click on the image. ... I found during my research. Check them Out! Thanks Angel, yes that is one of my favorite ones also. I generally prefer the horizontal posters as they make for a nice change! I like The Last Battle. These would be great in a child's room. Great article.